Although he is most famous for his classic novel of supernatural horror, The Beetle (1897), Richard Marsh's best work is often to be found in his short stories. And in The Seen and the Unseen, he is at his best. In "A Psychological Experiment," a man returns from the dead to exact a horrible vengeance on his killer. In "The Photographs," the officials at a jail discover ghostly images of a mysterious woman every time they attempt to photograph a certain prisoner. And in "The Houseboat," a married couple hires a houseboat for a romantic holiday cruise, but they get more than they bargained for when they learn a brutal murder was committed on the boat, a murder they see re-enacted before their very eyes. Nine other tales of mystery, murder, the supernatural, and the occult round out this thrilling volume. The Seen and the Unseen was one of Marsh's greatest successes, going through several editions, all virtually unobtainable today. 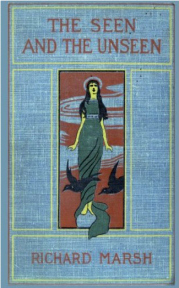 This new edition, the first in more than a century, reprints the extremely rare first edition, published by Methuen in 1900, complete with a reproduction of its cover.